Rip Rapson became president of the $3.1 billion Kresge Foundation in 2006. He has since changed the foundation’s focus from providing challenge grants that support building projects in local communities to program-related investments in seven areas, including community development, education, health and human services. Kresge also has taken a high-profile role in the revitalization of Detroit, not only by investing more than $100 million in recent years, but by actively participating in projects such as the M-1 Rail line and Detroit Works, a controversial effort to deal with the problem of abandoned and underutilized property in the city. Rapson has sometimes been criticized as being too involved in the affairs of Detroit, where Sebastian Kresge founded the S.S. Kresge dime store chain in 1912. He has clashed with Mayor Dave Bing, who complained in a 2011 Wall Street Journal article that Kresge was getting too much credit for work it and others were doing jointly in the city. But Rapson, a former deputy major of Minneapolis, said he has a good relationship with Bing overall and that Kresge will not shy away from its efforts to help revitalize Detroit. 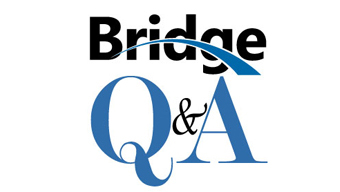 He spoke about that and other issues with Bridge correspondent Rick Haglund. Bridge: Why is Kresge putting a special philanthropic focus on Detroit? A: My sense is that Kresge had been a very good corporate citizen in terms of funding facilities, such as the riverfront and the Detroit Institute of Arts. The list is quite long and significant. But my feeling was that as Detroit was changing so dramatically, the approach of the foundation needed to be more flexible and more nimble. Rip Rapson of the Kresge Foundation still hopes that a light rail line along Woodward Avenue in Detroit could be operational by the end of 2015. The board agreed. So in 2006 and 2007 we began thinking what it would mean to be a more active and proactive participant in the progress that seemed to be a light on the horizon for Detroit. In 2006 and 2007, we were looking at a Mayor Kilpatrick who was filled with ideas, who could point to construction cranes downtown, hosting the Super Bowl downtown and a whole series of things that appeared to be moving in the right direction. We developed a fairly simple five-part program that emphasized trying to build further on our investments in the central business district and the riverfront development, where we had put $50 million on the table. We thought about how we could create a mechanism in which these new public spaces could be maintained over time. Events in 2007 and 2008, of course, changes all that. When the bottom fell out of the housing market, the credit market and the political market, we realized we had to recalibrate. When Mayor Bing was elected, it became clear we had an opportunity to start again and rethink: What was it that we could do that would add benefit to the work of others? I sat down on a Saturday, and just said, “What are the nine clusters of activity that we believe are the most promising in Detroit? What things are being invested in? Where is there leadership? Where do we believe traction is possible? Where do we believe long-term sustainability might be possible? I came up with a drawing that included our involvement in the New Economy Initiative for Southeast Michigan’s $100 million investment fund, education reform, the building of the light rail system and our cultural work, with a lot of things in between. From that time to this, we have found that nine-part strategy of re-imagining Detroit has held up well. Each of those nine bodies of work has in fact moved forward in very tangible ways. Money has moved into that space, leadership has moved into that space. There seems to be a growing acceleration of effort in that space. Perhaps more importantly those nine bodies of work are increasingly interconnecting in fundamental ways. UPDATE (Jan. 9, 3 p.m.): Kresge announced today that it has pledged $150 million for the Detroit Strategic Framework plan that grew out of the Detroit Works project. Bridge: Talk about the difficulties in establishing the proposed 3.3-mile M-1 Rail line along Woodward Avenue in downtown Detroit and where the project stands. A: When the secretary of transportation, the governor and the mayor announced the rapid bus system, that reset the clock on M-1. We put together a staff led by (M-1 Rail CEO) Matt Cullen and Laura Trudeau of our staff to answer one by one each of those questions. We have answered all 90 and I think we have done that to the satisfaction of the Department of Transportation. We have passed the Regional Transit Authority legislation, which was signed by Gov. Rick Snyder — an extraordinary milestone. The M-1 Rail project will move ahead to the next phase of advanced design very quickly once Transportation Secretary Ray LaHood makes his final determination about federal support for the project. We continue to hope the line will be open for business in late 2015 or early 2016. Bridge: You have said philanthropy has taken a seat at the table of civic leadership. That hasn’t always gone over well with the Mayor Dave Bing, who has complained that Kresge gets too much credit for its contributions to the city. How is your relationship with him these days? A: I think both the mayor and I agree strongly that in such challenging circumstances, we need everybody on deck. How different parties work together when there is joint work to be done is complicated. That has gotten played out in terms of Detroit Works project. If the mayor is going to focus on a handful neighborhoods and try to realign services in those neighborhoods, how does that relate to broader planning work the Kresge Foundation and others have underwritten to think more broadly and long term about the possibilities of land use in the city? It’s not that these things are at odds, it’s just that the points of intersection are sometimes complicated. Who does what? Who has the authority to do what? I think the mayor has been crystal clear that where the issue involves basic city services, he and the city council alone bear direct responsibility and will be held accountable. My sense is there is a partnership to be made between a city that has to focus on the fundamentals, and philanthropy and the rest of the civic community that can also work on additional quality-of-life issues that are important to the long-term viability and health of the city. I think he agrees with that. But there have been times when we have found that the lines are not as clear as we might like and there has been a little bit of bumping of heads. But in fairness to the mayor he has been very straightforward and direct about that and I have nothing but respect for him having done it that way. Bridge: What is the status of Kresge’s involvement with Detroit Works? A: We early on made a large investment at Kresge in the development of the long-term plan, which examines at a whole series of questions about how you look at land use in a more productive way. We’ve attracted the Kellogg and Ford foundations in that work. We weren’t alone in that, but Kresge has become identified with the Detroit Works long-term planning process because of our early investment. It is now largely in the hands of the Detroit Economic Growth Corp. They’re trying to bring all the community input, all of the technical analysis together into a final product. Bridge: There seems to be two schools of thought about what to do with the vast tracts of vacant land and abandoned housing in the city. One is to shrink it to a manageable size and the other is to promote growth to fill in those spaces. What is your view? A: I don’t think that’s the right way to frame the question. Detroit isn’t going to shrink. We have 139 square miles. Our boundaries are fixed. The question is what do you do within those boundaries? In some areas that’s very clear. Where there is stable, vibrant housing stock, you make sure it stays stable and vibrant. Where there are shoots of entrepreneurship and commercial activity, you try to make sure that you develop tools that promote them. There are as many opportunities with these large tracts of unutilized land as the imagination permits. You can think about reforestation. You could think about urban farming. You could think about clustering new housing and commercial development in nodes. I think one of the things the Detroit Works project will demonstrate is that there are multiple, viable options for using parcels of land that people have given up on. It’s complex. I don’t think the Detroit Works project is going to propose relocating anybody. I think it’s going to be about creating more positive opportunities for people to more forward. That’s a lot of emphasis on displacement. I think that again is the wrong question — not asking people to move but providing choices for people to improve life opportunities. Because it will be a very long-term process, it might be that people choose to stay where they are. Bridge: In your investment activities in Detroit, have you set specific goals over a certain period of time for what those investments should accomplish? A: It’s a very good question. Our board asks me that all the time. The answer so far has been no. When we began this in 2006 and 2007, we thought the reality in Detroit was quite clear — an upward line of opportunity and investment. And then 2008 came and everything was different. What I said to the board is that we need to put in place the fundamental building blocks to progress without prejudging what will come out of them. When you look at the architecture of change, the story is profoundly encouraging, from possibilities of education reform, to light rail, to Midtown anchors. There will be a time when you will want to hold us to quantifiable outcomes, but we’re just not there yet. We need to put in place the structures of changes and then we can measure how powerful that architecture is in achieving progress.